Let’s have an adventure on a secret beach. Okay, maybe it’s not a secret, I mean there’s a restaurant 2 steps away and someone else motored us to it, but no one else is here, so it feels secret! Let’s bake under the sun and float in the clear, turquoise water. When all of that gets too exhausting, we can unwind in the shade with a carafe of white wine and eat an amazing fish lunch. Let’s pretend this day isn’t going to end. We’ll sit and appreciate the breeze coming off the sea, the smell of pine trees and rosemary bushes. We’ll admire sailboats in the distance and hunt for the smoothest, whitest pebbles. But, sadly, the sun sets, perfect days always come to a close, and vacations have to end. We’ll do what can though to bring the vacation feeling home. I’ll look at the pictures and think about the clear water, the perfumed air, and, of course, I’ll remember the food. I mean, come on, it’s me. Alright, let’s see if we can bring our Croatian vacation lunch home to my Minnesotan kitchen. Let’s try making Gregada. If you’ve ever taken a look at a map of Croatia, you know they’ve got an awful lot of coastline and tons of islands, meaning water, beaches, and fish. All day, everyday. We spent half of our recent trip on the island of Hvar where you can find Gregada on just about every restaurant menu. It, like most Croatian food, is a pretty simple preparation that showcases a few good ingredients. Head to the fish market and get your hands on a good-looking pair of fish. 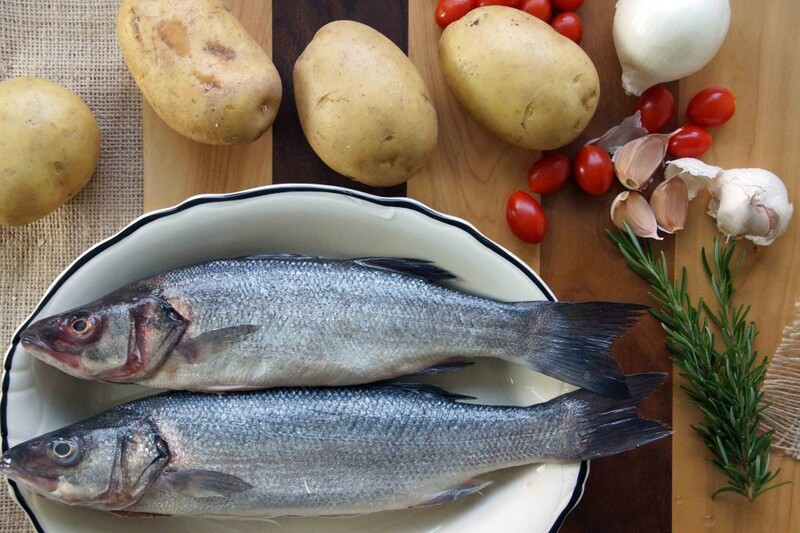 I chose Mediterranean sea bass (aka Branzino or Loup de Mer) although I think it was probably sea bream (aka Dorado or Orata) that I ate in Croatia. If you can’t find either of those, improvise. You’re looking for a white fish, preferably whole. What looks good, what smells the freshest? That’s the fish you’re after. The rest of the shopping list is short, just some potatoes, onions, garlic, and white wine. Add a few grape tomatoes, if you’d like, and make sure to have plenty of rosemary and parsley on hand. Get the onions in the pan first and let them cook for a minute or 2 before adding sliced potatoes, garlic, and tomatoes. 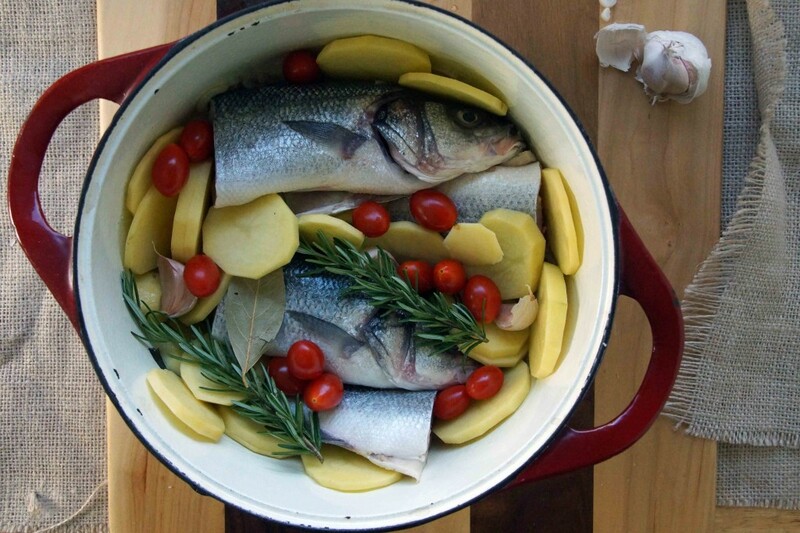 Nestle in the fish and tuck in a few sprigs of rosemary and a bay leaf. Pour in most of a bottle of white wine. 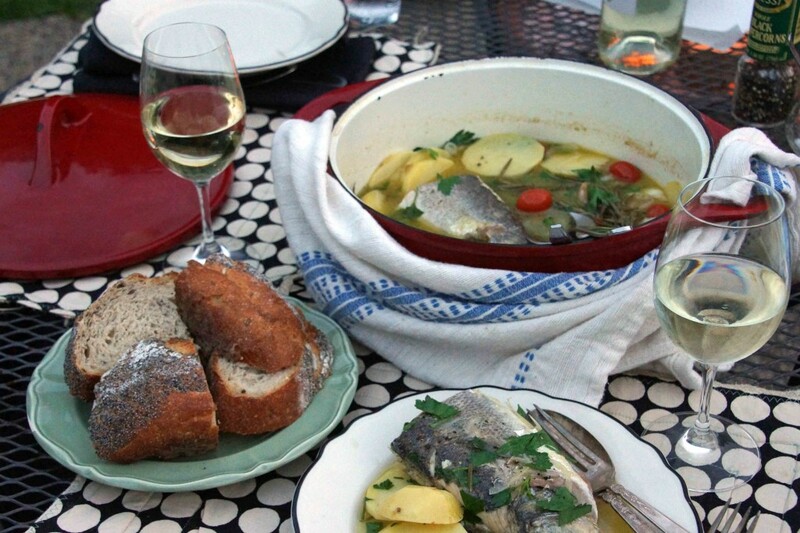 Pour the rest of the white wine for yourself and let your mind slip back off to that secluded Croatian beach as your stew simmers away. In 45 minutes or so, the potatoes should be tender, and the fish cooked through. Let the stew rest for a moment while you gather up bowls and dinner companions and head to the backyard to relive vacation without leaving home. Food memories and cooking inspiration are my favorite vacation souvenirs! Gregada is a simple fish and potato soup that I enjoyed at a tiny, beach-side restaurant during my recent trip to Croatia. Enjoy it at home, without the airfare. Heat the olive oil in a large, wide pot with lid or Dutch oven. Add the sliced onions and sweat down for 1-2 minutes. Add the fish, potatoes, garlic, and tomatoes and season well with salt. Add white wine to cover and tuck in the rosemary and bay leaf. Bring to a boil then reduce to a simmer. Simmer until the potatoes are tender and the fish is cooked through, about 45 minutes to 1 hour. Don't stir, as you will likely break up the potatoes and fish, just shake the pot periodically to make sure nothing sticks to the bottom of the pot. Allow the soup to rest, covered, for at least 15 minutes to allow the flavors to further meld. Remove the rosemary stem and bay leaf. Taste and season with additional salt, if needed, and freshly ground black pepper. Sprinkle on the chopped parsley. Bring the pot to the table and serve family-style with crusty bread and additional olive oil, if desired. My gregada turned out pretty well, though nothing could compare to eating it under the Croatian sun! Thanks for getting in touch with me and I loved seeing your website of beautiful pictures. You really need to go to Door County and try the fish boil!!!!! This recipe actually reminded me of it. Sounds hokey, but you’d love it! 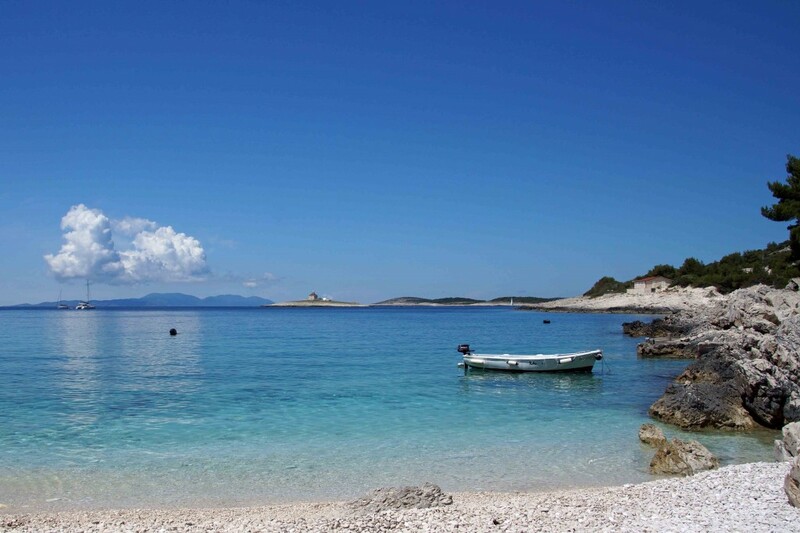 I’m thrilled to find your recipe – just returned from our trip to Croatia and loved the gregada we had in Hvar. I am totally going to try your recipe as soon as I find some suitable fish 🙂 Thanks! Hi, Sneshka. We loved getting to spend a couple of weeks in Croatia and hope to return again someday. 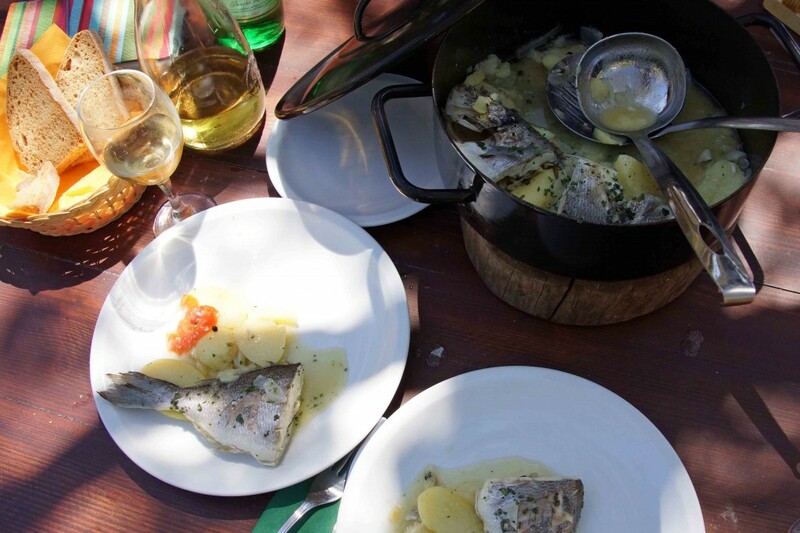 I really enjoyed the simple and fresh fish preparations, all of the gorgeous beaches and, of course, the fantastic wines! I hope you still get to visit your beautiful homeland often!